In the aftermath the death of King T’Chaka of Wakanda (as seen in Captain America: Civil War), his son T’Challa (Chadwick Boseman) ascends to the throne and becomes the new Black Panther, charged with protecting the hidden kingdom and its people. But years before, T’Challa’s uncle N’Jobu betrayed Wakanda by helping an arms dealer named Ulysses Klaue (Andy Serkis) to steal some of the rare metal vibranium that’s abundant in the kingdom. Then a child, N’Jobu’s son, N’Jadaka (Michael B. Jordan), was abandoned by the former King to live a life of poverty and violence in the outside world, eventually becoming an American black ops soldier and finally allying himself with Klaue as a mercenary. Now, with the new Black Panther only just crowned, N’Jadaka (who calls himself Killmonger) returns to Wakanda seeking revenge and a chance to fight T’Challa and take the throne for himself. Directed by Ryan Coogler, Black Panther is a genuine achievement and a completely refreshing installment of not only the Marvel Cinematic Universe but the superhero genre at large. If one were to compare the MCU to a box of crayons, one of the most impressive aspects to Marvel’s success is the way they continue to find striking new colors within that box. They do this not just by mining their own vast library of characters and stories for material, but also by continually recruiting new filmmaking talent to work with them. After establishing himself with two terrific films (Fruitvale Station and Creed), Coogler doesn’t just rise to the challenge of directing a Hollywood blockbuster, he soars with it. By making the work deeply personal, and by fully embracing the rare cultural and social opportunity that Black Panther represents by its very nature, he’s created a superhero film that feels fresh and original, deeply humanistic, and richly-drawn all at once. The cast is almost entirely black and it’s just magnificent from top to bottom. There are so many good performances here it’s hard to know where to start; certainly Boseman and Jordan deserve kudos but that’s just scratching the surface. Between the talent on screen and the production design that supports it, Wakanda comes to life as a fully dimensional and believable place. This is world-building as good as any the cinema has to offer. It also turns out that Andy Serkis plays a helluva good villain. Black Panther was shot digitally in the ARRIRAW codec (at 3.4K) using ARRI Alexa XT cameras and was finished to a native 4K Digital Intermediate. That source has been graded for both HDR10 and Dolby Vision and it’s presented here on Ultra HD at the proper 2.39:1 theatrical aspect ratio. Detail is crisp and texturing is refined, especially noticeable in skin and facial features, as well as costume fabrics. The High Dynamic Range renders a vibrant and highly-nuanced quality to the film’s rich color palette. The blue shadings on T’Challa’s helmet when we first see it are remarkable, as are the colors visible in the shimmering night sky during his first visit to the ancestral plane, and those in the elaborate ritual costumes of T’Challa’s coronation too. Contrast is very good, though while the brightest areas of the frame have nice gleam and pop, they’re not quite as bright as the highlights on other recent Marvel films released in 4K. On the other hand, the film’s darkest scenes (including the Oakland apartment interior and the Nigeria jungle rescue) are very dark indeed – notably darker than they appear on the Blu-ray version of the film. They’re not Arrival dark (see our review here), but those viewing this 4K image via HDR10 will definitely benefit from watching it on a truly bright and capable display, while those with Dolby Vision compatibility will be glad they have it. Overall, it’s a strong image, but it lacks a bit of the pop of... say... Thor: Ragnarok and Guardians of the Galaxy 2 in 4K. And you’ll definitely want to darken your room while viewing it. Audio on the 4K disc is available in a good English 7.1.4 Dolby Atmos mix. As was the case with Thor: Ragnarok, it feels a little restrained until you turn up the volume a bit. Then it’s smooth and more expansive, creating a very natural soundscape, though still not a particularly aggressive one. Staging, directionality, and panning are excellent, with nice activity in the height channels, especially during battle sequences. Bass is fine, but lacks the punch and heft it might have. This is a solid mix that serves the film well enough, but it might leave you a bit wanting. Additional audio options include English and Spanish 7.1 Dolby Digital Plus, English 2.0 Descriptive Audio, and French 5.1 Dolby Digital. Optional subtitles are included in English for the Hearing Impaired, French, Spanish, Chinese, Korean, and Thai. It’s good material overall, if a bit glossy. But the audio commentary and the roundtable discussion in particular are outstanding and well worth your time. Naturally, there’s also a Movies Anywhere Digital code on a paper insert. 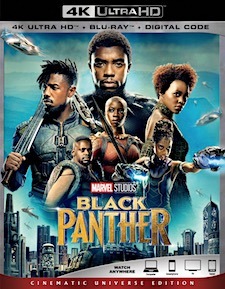 There can no longer be any doubt that Ryan Coogler deserves a place high on anyone’s list of filmmakers whose work qualifies as “must-see.” Black Panther is not quite a perfect superhero film, for it ultimately devolves into a giant melee of digitally-rendered carnage, like so many other examples of this genre. But it’s certainly remarkable and a rarity, and for more reasons than one. What Black Panther gets right, it gets very right. To see this film in a theater, surrounded by the most wildly diverse and enthusiastic audience for a film like this in recent memory, felt like a privilege. To see it again on 4K Ultra HD is a pleasure, though not quite a reference-quality one. Especially from an audio standpoint, Disney’s 4K team needs to step up their game.